It's no secret that I absolutely love to bake. At my previous workplace, I was constantly pestered about bringing my double chocolate chip cookies in (which I'll definitely be putting a post up about soon), and my manager even suggested that we sell them. But today, I'm sharing a recipe that I used to love when I was younger, and re-discovered quite recently. 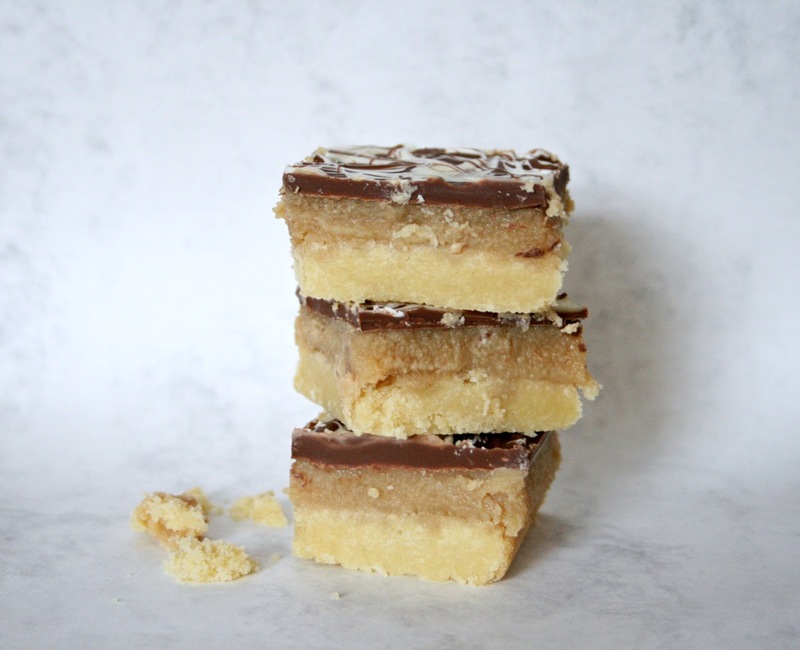 It's a classic millionaires shortbread, with the standard buttery shortbread base, smooth caramel centre and solid chocolate top. However, I tweaked this recipe slightly to add sea salt to the caramel, for that indulgent salted caramel and chocolate taste that everyone knows and loves. This is a really easy recipe to follow and it's ideal for killing time on a rainy afternoon! Let's get the ovens going. Preheat your oven to 180c/gas mark 4. Lightly grease a 13 x 9 inch tin and line the bottom with parchment paper. If your tin is smaller than 13 x 9, you may need to reduce the ingredients to stop your treats becoming too thick, and vice versa if your tin is bigger. To make the shortbread, put your caster sugar in a bowl and sieve the plain flour in. Add in 175g of your butter, and rub it in until your mixture resembles fine breadcrumbs. Be patient with this, as you don't want big lumps of flour in your shortbread! Once the mixture resembles breadcrumbs, tip it carefully into your prepared tin. With the back of a tablespoon, spread the mixture evenly and press it firmly into the bottom of the tin. You want this to become one solid slab of biscuit, so make sure that you smooth over any cracks with your spoon. Prick it lightly with a fork and then bake in the oven for about 20-25 minutes, or until firm to the touch and very lightly browned. Remove it from the oven and allow it to cool in the tin. Whilst it's cooling, we can start to make the caramel. Add the remaining 100g of butter into a pan, along with the muscavado sugar, and gently heat until the sugar has dissolved. Make sure you don't have the heat too high, otherwise the sugar will burn. Pour in your condensed milk, sprinkle in the sea salt, and bring the mixture to the boil, being sure to stir constantly. Then reduce the heat and simmer very gently, continuing to stir, for about 5 minutes or until the mixture has thickened slightly. Don't worry if you think that it is still too runny, as it will become firmer as it sets. Pour the caramel over the shortbread and leave it to cool. If you're impatient like me, you can put it in the fridge to set. Once it has set, you can make the topping. Of course, how you top your shortbread is entirely up to you, this is just the way I prefer. Melt the milk chocolate in a bowl, either in the microwave or over a pan of hot water. Melt the white chocolate in a separate bowl. Pour the milk chocolate over the caramel, smoothing it out with a spoon so that it coats the whole thing. Add blobs of white chocolate on to the milk chocolate at random, and swirl a knife through the to create a marble effect. Pop the whole thing back into the fridge to set. Cut into squares or bars and enjoy! To add some extra saltiness, you could decorate this shortbread with a solid milk chocolate topping and a sprinkling of sea salt. Or you could drizzle the white chocolate over or add Maltesers. There are so many ways to make this recipe your own, and it is guaranteed to be a crowd pleaser. I managed to make about 16-18 slices of shortbread from this recipe, but it depends on the size of your tin and how big you want your slices. It is seriously mouth-watering and extremely simple, so I urge you to give it a go!